Hey, are you looking to have a great fun with a fantastic ride? If YES, then skateboard will be the best option for you by all means to actualize all of your dreams. Skateboarding is an effective form of physical exercise as well as it saves your money also when you use it for going to your near destination on a busy road. Therefore, if skateboarding is your passion and if you are looking for the best skateboards, then with this in mind you are in the right place, my dear. It doesn’t matter if you’re a beginner or you’ve been doing it a while. Having a proper complete skateboard makes learning new tricks easier, and it makes skating much more fun. There’s adventure out there, and half the world is covered in concrete. What are you waiting for? Let’s roll! Powell Peralta is one of the iconic brands in skateboarding. Its team from the 1980s, the Bones Brigade, was a major influence on what skateboarding would become. Powell, singular, is a spinoff of Powell Peralta, and its boards are intended for beginners. They are made in China with the same machines and — importantly — glues that Powell Peralta uses in its California factory. 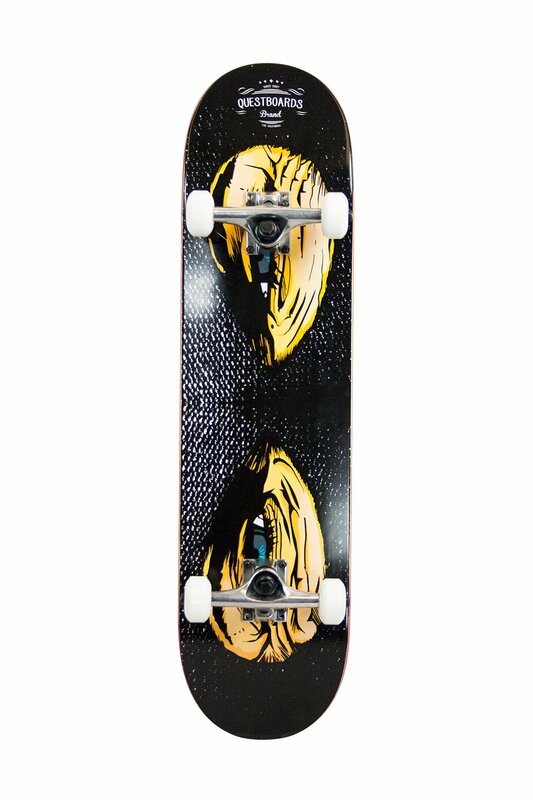 This Golden Dragon deck is 7.625 inches wide and 31.625 inches long, which is a little smaller than the average modern street deck. It is made from seven plies of maple, and it has a deeper concave than some others on this list. The deeper concave allows Powell to make the board thinner without losing strength. This board is one of Powell’s ligament decks, meaning it has a polymer strand running through it to hold it together should it break. The Powell trucks are all-aluminum, with carbon steel axles. The Powell urethane wheels are 99a and 54mm, which are typical specs for street skating wheels. The bearings are a weak spot, though. They are slow when new and they only get slower, and they will require upgrading sooner rather than later. Puente Skateboards operates out of Puente Alto, Chile. They are popular boards in Latin America because of their homegrown roots, but also because they are decent quality. If you like the deck, these boards are a good option because it will last longer than the rest of the components. Puente uses all-maple construction for its decks, and the concave is mellow but functional. The 31-inch length is a bit short for the 8-inch width, but that is a personal preference and may even help when learning spinning tricks like 360 flips. The Puente trucks are all aluminum, with steel axles. The baseplates are an issue, though. They appear to be poorly engineered and may crack. A truck upgrade is first on the to-do list, but should not be a deal breaker. The wheels are polyurethane, but Puente does not specify height and hardness. They appear to be about 53mm, though. The bearings roll well compared to some on this list, and should last you a while. Bearings can be a more affordable upgrade than trucks, but you should get better trucks first. 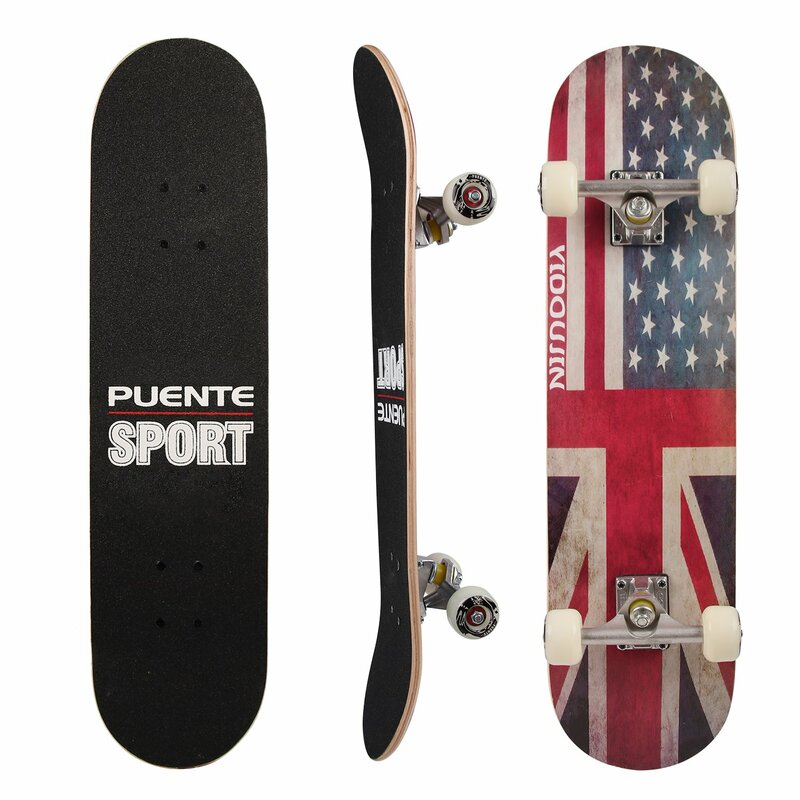 Still, with current trends in Puente prices, even adding in the price of a truck upgrade nets a good deal on a solid beginner’s board. There are lots of skateboard brands available on the market, but only this particular one has an entirely different perspective. 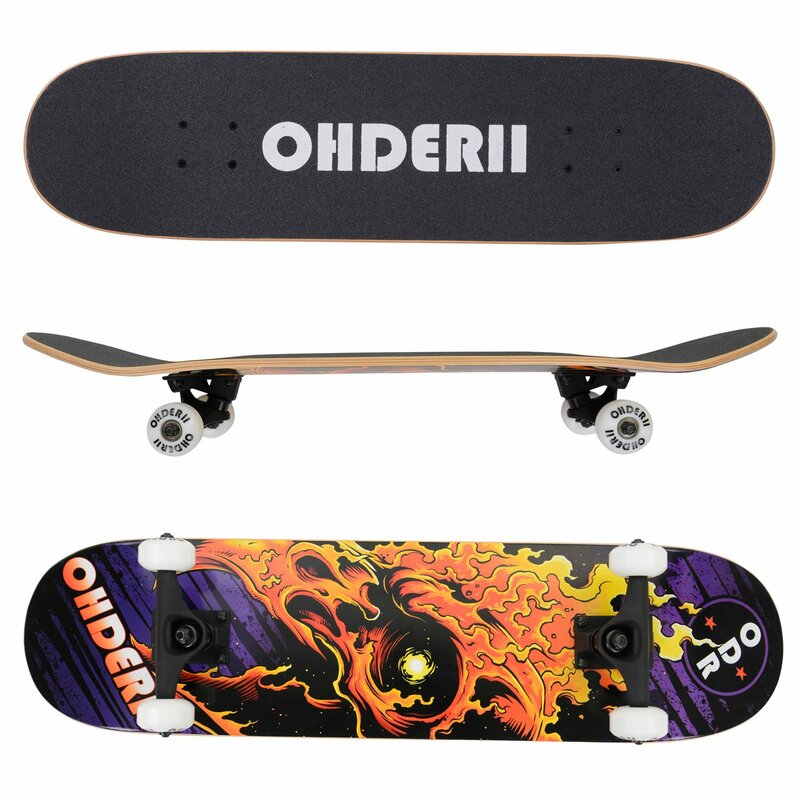 It doesn’t matter if you are a professional or beginner, with this Ohderii Skateboard you will get everything you always wanted. The high-quality material will make it more durable and resistant to impact because of ABS material base. At the same time, it contains high-quality PU wheels and 7-ply of Canadian Maple. The best thing about it is that it is waterproof and you can comfortably ride it on uneven terrain and surfaces. The installation is simple, and you will get pre-assembled fittings so that you get more convenience. Therefore, the installation cycle will reduce. You will also get ABEC 7-inches bearing with great dimensions of 31 x 7.9 x 3.9-inches. 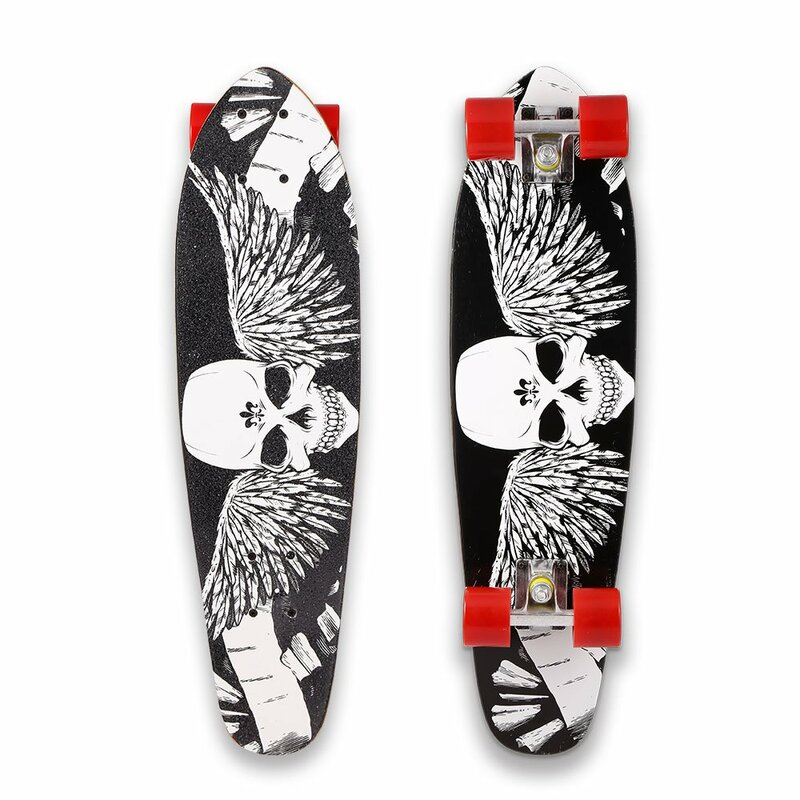 The low riding longboard is perfect because you will get the maximum control and stability. That way you will be able to enjoy downhill carving or any other trick that will provide you additional satisfaction and happiness. You can quickly make a slider, the U table or plates off, without any further problem. You will also get one year of warranty which is an excellent solution in case that you have any problems in the first moments. But we tend to think that you won’t have any problem because this particular skateboard is durable and great for both professionals and beginners. Excellent load bearing can keep up to 220 lbs. 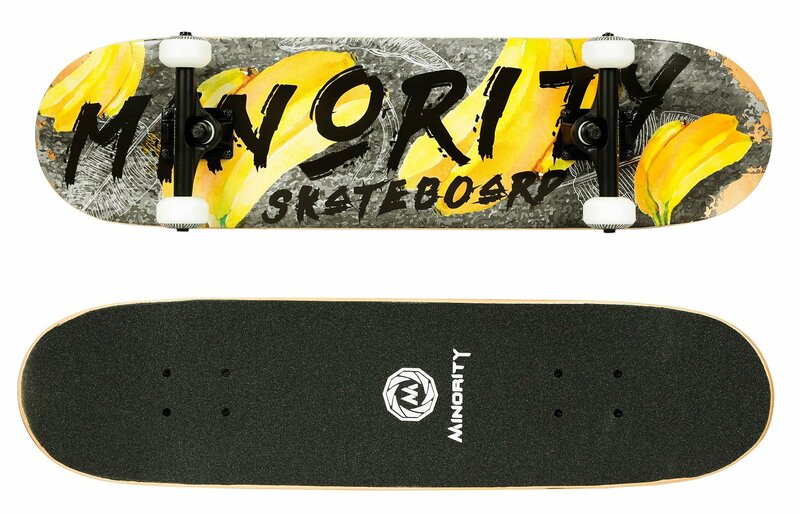 If you want to purchase the best skateboard on the market, you should choose this particular one. It is the latest achievement in the world of skateboarding that combines durable and high-quality parts with top-notch materials. The deck contains 7-ply Hardrock maple as well as the epoxy glue that will support the weight up to 220 lbs. At the same time, you will get an auspicious kick and concave which will provide you fantastic maneuverability and extraordinary physical performance. The trucks contain 5-inches genuine aluminum alloy. When it comes to hardware, you should have in mind that it includes kingpin, carbon steel axle and many more. Bearings contain ABEC-9 with chrome steel as well as high rebound PU wheels so that you can get the immersive amount of power without any additional problem. It is excellent for both cruising and doing tricks on the street. You can unlock the full potential after first use. The responsiveness and turning accuracy are always on your side. At the same time, you will get latest safety features that will protect you from any potential impact. The artwork uses advanced print technology. Finally, you don’t have to worry whether print will fade away. That cannot happen because of new printing perfection that will make your skateboard always look as new. You can choose vintage to trendy graphics which makes it ideal as a gift. This product doesn’t support international shipping. Pos​​itiv came into existence in 2012, and is operates under the Skate One umbrella with companies like Bones and Powell Peralta. Its riders include great skaters like Andy MacDonald, Sandro Dias and Fabrizio Santos. Positiv’s product line includes several different complete boards. The biggest one, but the one most in line with modern street and park board sizes, is the Andy MacDonald model. The deck is 8 inches wide and 32.125 inches long, and its concave is on the deep side. The tail and nose are almost equal in length — about 6.5 inches. Positiv decks are usually maple, but some are hard birch. They are made using the same laminating process and glue that Powell Peralta boards use. These decks have Positiv’s super slide treatment (SST), which is essentially a plastic lining that makes the board slide more easily. The stuff works, and wax becomes less necessary for slides with these boards. The urethane wheels are 54mm tall and 99a, which are ideal for street skating. The Skate One Mini-Logo bearings are some of the best on this list, and they come lubed with Bones Speed Cream. Skate One also makes Bones bearings, so consider these Bones Reds’ little brother. The Positiv trucks are another matter, though. At 7.625 inches wide, they sit ideally just inside the edges of the 8-inch deck, which keeps the threading on the axles safe. The Positiv trucks simply aren’t as solid as others on this list, and will need an upgrade before the other components. SCSK8 has been making skateboards since 2010. The company fills a niche in affordable skateboards that few manufacturers go after. Their boards are some of the most affordable on this list, and they offer a lot of board for your bucks. SCSK8 components may require upgrading sooner than some other complete boards, but they get the frugal skater on a board. 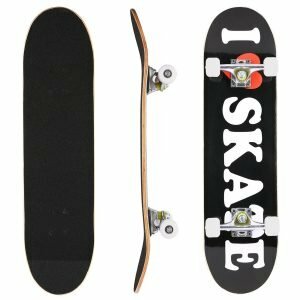 These SCSK8 decks are seven plies of maple, and are 8 inches wide and 32 inches long. These are common dimensions in modern street skating, and will suit adolescent riders better than skaters who are younger than age 12 or so. Adding to the cool factor is that there are many different graphics to choose from. 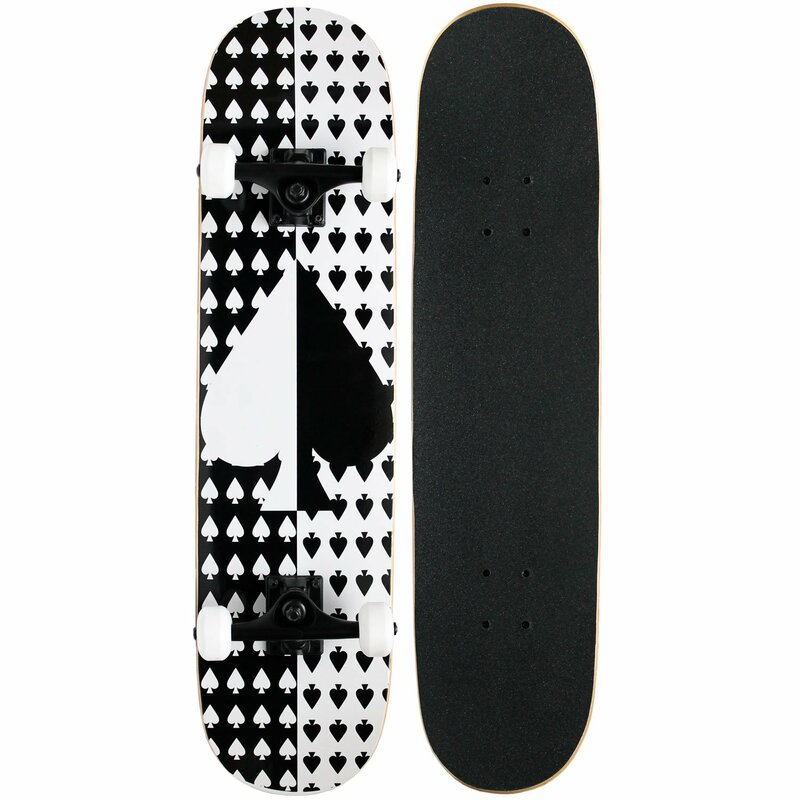 SCSK8 also uses some of the best grip tape in this category of skateboards. The wheels are 52mm and 101a durometer, which is both small and hard. Many street riders prefer these dimensions. SCSK8 claims its bearings are ABEC-9, but they are abnormally slow and will require an upgrade if real street skating is on the agenda. The aluminum trucks have 5-inch hangers. They are low quality, though. Better trucks and bearings will make these boards decent performers. Krown Pro Complete, or KPC, skateboards are the upper level boards by this off-the-shelf board company. Krown makes street skateboards geared toward beginning riders, but the Pro Complete series utilizes better quality components than Krown’s Rookie series. The Canadian maple decks are 7.75 inches wide, which is a good middle-ground width and should do well for smaller and larger riders alike. While not as stable as wider boards, decks under 8 inches are easier to learn kickflips and heelflips on. The concave on the KPC decks is quite mellow, which new riders tend to prefer. Deeper concave holds your feet in place, but it also prevents easy bails. Krown trucks are painted aluminum, and they have 5-inch hangers with steel axles. The Krown graphic urethane wheels are 52mm. Krown gives no durometer, but these wheels are softer than many on this list. The bearings on Krown boards are notoriously slow, and an upgrade will be necessary to experience high-speed skating. A bearing upgrade and some harder wheels will make these boards more user friendly, but the deck has good pop for the class. Catering to the more frugal skateboarders out there, Anc​​heer makes solid, but no-frills skateboards. The components may be basic, but they are mostly functional and can take abuse. Beginners put their boards through hell, so do not underestimate the value of a solid setup. Ancheer uses seven plies of maple in its decks. The individual layers are rather thick, though, leading to a solid but heavy board. There is very little in the way of concave, and even the nose and tail have less kick than most other beginner’s boards. As you progress, you may wish for a steeper nose and tail, but at first this type of board is all you need to start learning. At 7.6 inches wide and 30.6 inches long, the Ancheer is a smaller board, the size some people call a mini. This is a better size for smaller skaters than larger ones, unless they can skate freestyle like Rodney​​ Mullen. The trucks are aluminum and are little better than okay, but the ABEC-7 bearings are a strong suit. They roll smoothly out of the box and get a bit better over time. The wheels are the wrong choice from the manufacturer, though. At 55mm, they are a normal height, but their 85a durometer is completely wrong for street skating and more in line with longboarding. They may roll smoother, but they will never last under the stresses of street skating and require an immediate upgrade. So what are the Best Skateboard for you? The Best Skateboard For Beginners on this list will all suit one type of person or another, but they all have drawbacks that keep them from being true pro boards. The best skateboard is the one that requires the fewest upgrades to be great. Replacing skateboard parts is just part of the game, as street skating is destructive by its very nature, but it should take a while. The Powell Golden Dragon Flying Complete is the most complete board on this list, in the sense that all of its parts are well suited for street, park or ramp skating right out of the box. No trip to the skate shop will be necessary for a while, giving you time to browse and pick out the best trucks, wheels, bearings and, eventually, pro deck for you and your style. Street skaters don’t look at new parts as upgrades, we look at the old ones as thrashed. Cheap adhesives lose their hold causing layers to split. Manufacturers that use cheap glue will not warn you, so read the fine print. These days, trick-board shapes are all relatively the same, but deck shapes evolved over time. This article is a good overview on how that evolution went down. Trucks need aluminum hangers for grinds and steel axles for strength. Bushings should be polyurethane, and are upgradeable. This Video showing how trucks are made, which also contains a manufacturer’s thoughts on why skaters choose certain trucks. The hardness of urethane wheels — called the durometer — varies. Street skaters typically use 97a to 101a because hard wheels slide much better on obstacles. Wheel height also varies tremendously, but street skaters tend to use wheels that are around 55mm tall. Urethane revolutionized skateboard wheels in the 1970s, and it is still the material of choice. This article tells about the evolution of the urethane wheel from early clay and metal wheels. This Video shows some examples of vintage completes in a museum. Bearings are rated by the ABEC scale (1-9), which has nothing to do with skateboarding. Manufacturers know skaters believe higher ABEC ratings mean faster bearings. They do not, and you won’t find high-quality bearings on off-the-shelf skateboards. Most of these completes are slow. Make a bearing upgrade a top priority. Good bearings can make almost any skateboard fast. This article by longtime pro Anthony Pappalardo gives an insider’s perspective on bearings. My experience getting into skating works for anyone. I started with an off-the-shelf board. My first upgrade was bearings, and better wheels followed. Next, I got decent trucks. With quality under the deck, I was amazed at how quickly I improved. When I finally got a pro deck — the most expensive upgrade — I had a custom complete.